Ok, I’m tired of this wintry weather (it’s snowing again here in New York), so I’m going to chase away cold with cold and a little là 辣 (spicy)! 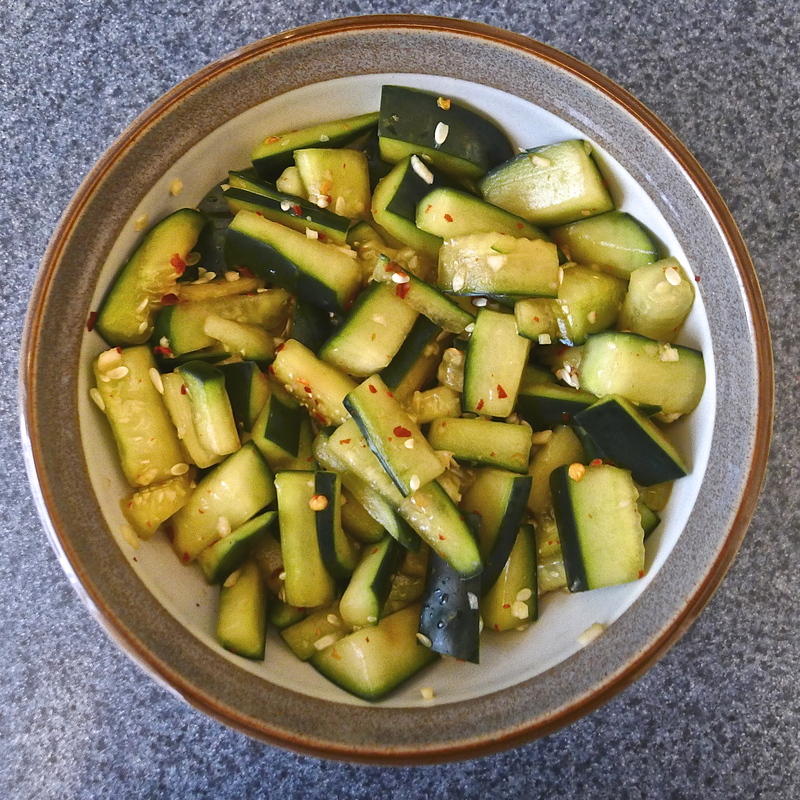 I am making 小黄瓜 or “small yellow cucumbers.” If you like pickles or kim chi, you’ll love this dish/appetizer, but it’s not quite as sour or as spicy, with just a tickle of sweet. It’s insanely easy to make, served cold and very refreshing, especially on warm, hot days or before a main dish. (I personally like it on any day, at any time, but today, I’m using my witchy-witchy and wishful thinking in the fantasy that it’ll help bring about warmer, spring weather). You can use Chinese yellow cucumber which is better, very crisp, but because I’m not trekking out in the blustery winds today to get yellow cucumber, I’m just using regular good old cucumber. Cut off the cucumber ends. Then keep cutting the cucumbers in half length-wise so you have long, thin pieces, about 1/4″ thick. Put all the pieces together and slice vertically into smaller pieces, about 1″ in length. You can serve this right away. Better yet, refrigerate for several hours to allow the flavor to sink in. This also makes the cucumber a bit more tender. To serve, strain out the additional liquid. Serve in a small bowl or dish. I personally just ate half of what I made without waiting. This entry was posted in Food, Recipes and tagged appetizer, Cucumber, hot and spicy by wodezitie. Bookmark the permalink. 谢谢 My wife and I make this dish all the time, its great, full of flavour and just perfect.